I love quick and easy strategies for my students. As an elementary teacher for over a decade, I really had fun teaching nonfiction (now informational) text with my third through fifth graders. With the pervasive nature of the new Common Core Standards, this is a requirement in classes now. Here is a great strategy to use with your students in grades 1-5 (maybe even older–this works with middle school as well) to introduce and keep reinforcing nonfiction text features. Taught during Reading Informational Text (RI) Standard 5, students are tasked with understanding how text is organized. The purpose of this knowledge is that understanding nonfiction features helps the reader to comprehend the text more effectively. Informational text allows readers to experience the content in a variety of different ways. Unlike stories, there is not always a clear beginning, middle, and end. Students can explore charts, graphs, illustrations, hyperlinks, photographs, and a wide variety of visual types of “text” before they ever begin reading what we view as the traditional text. Everyone notices different things! With Common Core, this is okay; in fact, this is expected and taught in Reading Standard 7. 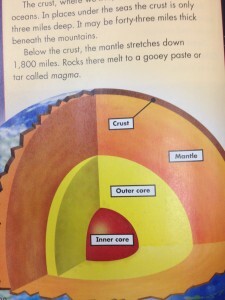 A text feature from a third grade science textbook. To teach elementary students to navigate Informational text, they have to understand that there are multiple features; know what they are, and how to extract meaning from them. To teach this, discuss how informational text is multimodal. Find strong examples of each feature in real text to share and discuss with students. Let them reflect on what makes these features useful, intimidating, or supply a deeper level of understanding. 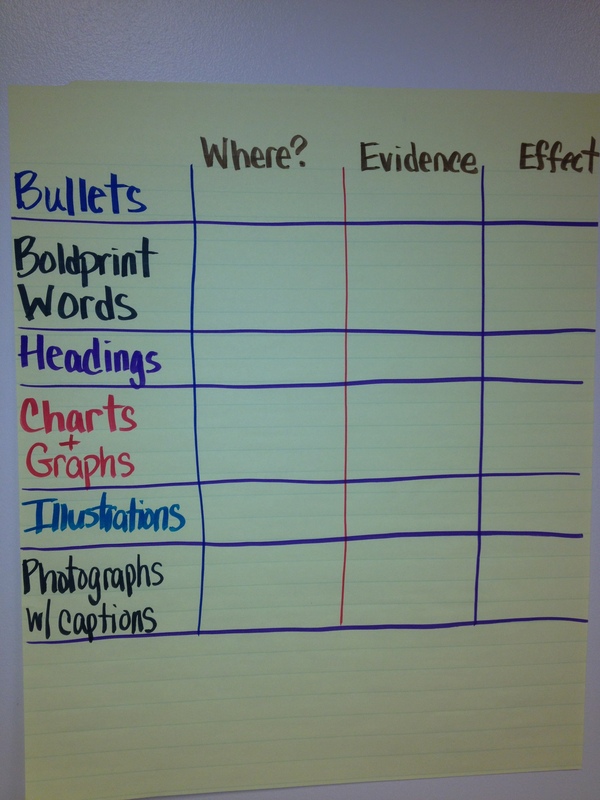 Student should not just recognize what a bullet looks like, but know that it makes it easy to read a short list and pull out central ideas (Reading Standard 2). An easy resource? Your science and social studies textbook! If you don’t teach those subjects, what a great opportunity to have students bring in their science books from their other class or borrow them from another teacher to make cross curricular links. 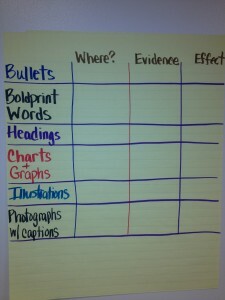 A great activity to do once you have assembled text with different features is to create an anchor chart. Considering the demands of Common Core, you want to avoid creating charts like the ones that I often see on the Internet. I won’t reveal the names of the sites that I have seen that suggest this, but they fail because they have students to Scavenger Hunts to find examples of text features. This is absolutely worthless unless you teach K-1. Students are only identifying what the features look like, not the effect or meaning that they carry. Common Core is looking for the textual example of the feature and wants students to analyze the value of the feature. You want students to tell you what they see. Give the evidence/ example/ proof of the feature. This means that they are showing some evidence that they saw the feature and the information in it. If this poses a challenge, consider replacing this with Description. To really get students engaged in the language, consider changing Where? to Text. Common Core relies on that term (which is more appropriate) when referencing written or multimodal text. Add in features as you introduce or address them-not all at once. Spend time discussing how features help the reader make sense or better understand the content. This is the effect. Encourage students to make judgment calls about the feature and its effectiveness. Make smaller versions of the chart for students to complete by feature. This is where they could hunt for a certain feature or a few at a time. As you scaffold this, do it as a class, then slowly release responsibility to students in collaborative pairs, groups, or individuals. You can judge based on your observation of your students and their demonstrate level of understanding. A great feature of introducing text features is that you can stick it on a wall or bulletin board and pull it out when you come across a new one. The lesson will continue all year. The best feeling? When one of your students runs over and wants to tell you how a text feature is working in a book of their own!